Nest, the Google-owned company behind the ‘conscious’ in-home thermostat and Nest Protect smoke alarm, has announced today that a range of new features will soon start rolling out to Nest Protect users around the world. Among the new features is a 10-day history of your Protect use, which details exactly what happened (and when) day-by-day and displays higher-level data using graphics to help you get a better understanding of your home. The idea being that you can learn how to avoid triggering alarms by accident. There’s also a ‘steam check’ feature, which the company says will cut down on the number of times an alarm is triggered by a sudden waft of steam from a bathroom when a door is opened, for example. “It will use its built-­in humidity sensor and new algorithms to understands the difference between steam and smoke. 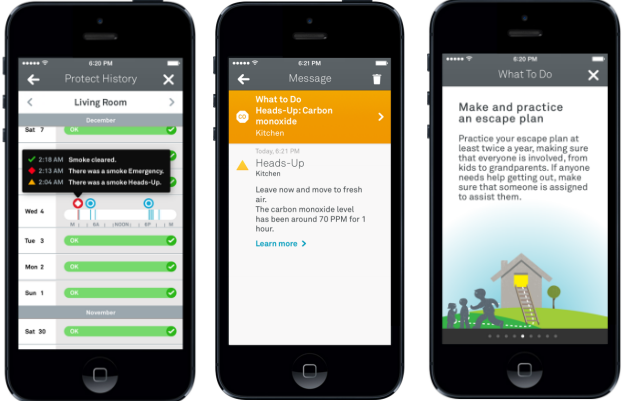 Even with a very conservative approach – Nest Protect has to be 100% sure there’s no fire – Steam Check cuts down nuisance alarms from steam by more than half. That’s based on data from real homes, not lab testing,” Nest said. More importantly, following the update, users will also get more detailed feedback about carbon dioxide levels in the air too, easily conveyed through use of a color-coded scale. As well as alerting you to possibly dangerous levels of CO2, it also gives useful practical advice on what to do. For wired Protect users (there’s a battery-only model on which this feature is not available), you can now select to switch on the illuminating Pathlight feature permanently at night. Battery and wired Protect users will also be able to control the brightness of Pathlight from the iOS or Android app. While there are quite a few changes for Nest Protect’s 2.0 software update, a spokesperson for the company confirmed to TNW that the ‘Wave’ feature, which was removed as it had the potential to disable the smoke alarm in rare circumstances, would not be returning any time soon. Never say never, though. The software will roll out automatically to Wi-Fi connected Nest Protect devices over the next two weeks, the company said.